You can purchase on i-Tunes using this button or use the other links on this page to purchase from CDBaby. With all the trouble in this world, can my one voice make a difference? Can yours? In the power of Jesus Christ, it can. One day someone said to me, “The world is such a mess. I just don’t see how I can make a difference.” That got me thinking, and the song “One Small Voice for God” became my answer to this friend. We can each make a difference, wherever we are. If we stay close to our Savior and obey, God will provide many opportunities for us to love and serve in His name. Our actions may seem insignificant in view of all the world’s problems, but through God’s obedient children He will make a huge difference in the world. 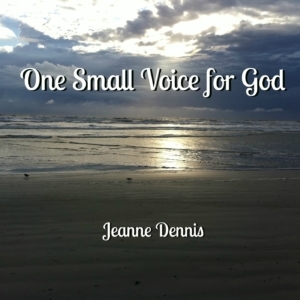 Each and every one of us can be one small voice for God. In the music video, photos not taken by Jeanne Dennis are used by permission of Morguefile.com photographers, especially Anita Peppers (anitapeppers) and Mary R. Vogt (taliesin). 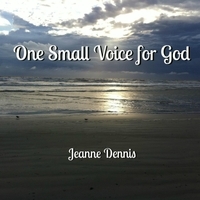 “One Small Voice for God” is available online. Watch One Small Voice for God video. In my relationship with Jesus, I can truly say I rest In the Arms of Perfect Love. 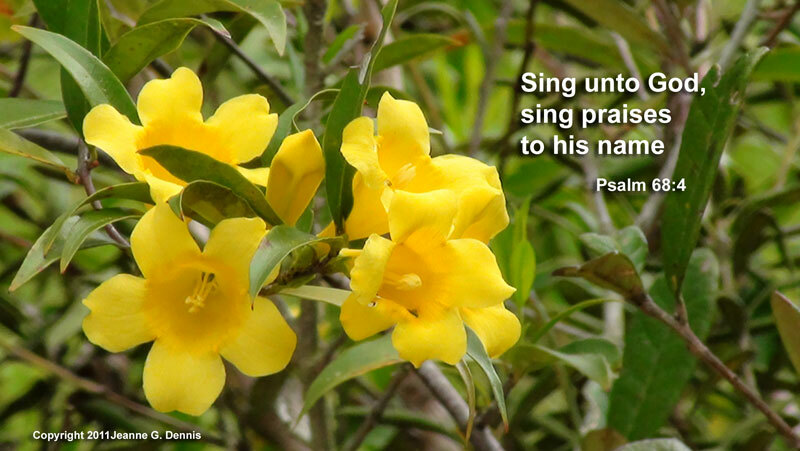 May He receive all the glory and praise He deserves. “In the Garden” is the traditional hymn by C. Austin Miles, minus his third verse. I felt the third verse was too obscure for today’s listeners, so I wrote two new verses that express the essence of his third verse in terms people today can understand. These lyrics also describe my experiences in my walk with Jesus Christ. The music and first two verses of “In the Garden” are in public domain; however, the last two verses, my lyrics, are copyrighted. In writing “Heavenly Eyes,” I searched the Bible for all the references to God’s eyes. Psalm 32:8 says that He will guide us with His eye. His eyes watch over us, see all our sorrows, delight in our joys, and burn like fire in their holiness. The Lord gave me “Thank You for Salvation” at the end of a miserable day when everything reminded me of my life before Jesus, and guilt for past sins threatened to overwhelm me with grief. Then God reminded me that Jesus’ death paid for my sin. All of it. According to the Word of God, His righteousness now covers me, and He has separated my sins from me as far as the east is from the west. As I contemplated God’s grace, His unfathomable gift to those who dare to trust and believe in Him, “It’s Your Grace” was the result. Amazing, astounding, incredible – words can’t begin to describe God’s grace given to us in Jesus Christ. But I still had to try. I couldn’t keep silent about such a wondrous gift given to those who could never deserve it! “True Bread from Heaven” is a new twist on a very old hymn. 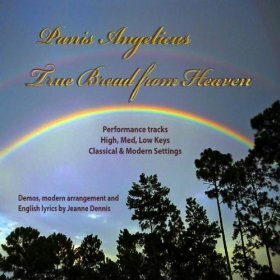 To the music of César Franck’s “Panis Angelicus,” originally with latin words, I wrote new English lyrics that would be acceptable to both Protestant and Catholic listeners. Then I set the song in a more modern arrangement. In my new lyrics, I tried to keep the heart of the original message: the wonder that God Himself became a man and is the “true bread from heaven” for all who believe in Him. “As a Little Child” resulted from my wondering, as I wrote my book Running Barefoot on Holy Ground, what Jesus meant when He said we must be as little children to enter heaven. I started writing “Climb on Daddy’s Lap” many years ago when my daughter began growing too big for my own lap. I wanted to help her learn to transfer her dependence on us to her heavenly Abba (Daddy). She is now a mother herself. I finished the end of the song when it came full circle, as I watched my sweet Daddy preparing to meet Jesus. Dad now rests in those heavenly arms. The phrase “The Reason We Do Not Fear” came to me suddenly. Then I thought about the things we fear: danger, evil, loss, death, abandonment, and facing our own guilt and God’s judgment. Also, believers often fear telling others about salvation in Jesus Christ. I realized that when we belong to Him, we have nothing to fear. Jesus said, “Perfect love casts out all fear,” and Jesus is that perfect love. 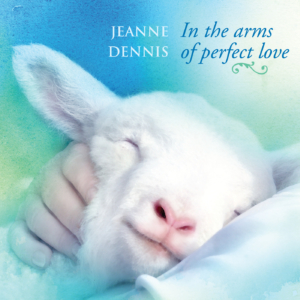 The song “In the Arms of Perfect Love” came about when I realized that, as God and my Creator, Jesus already had every right to my life, my affections, and my obedience. Yet He gave me the choice to accept or reject His lordship. When I did surrender all, I found that His arms, the “arms of perfect love,” were “where I belonged all along.” The introduction to this song includes the chorus to the popular hymn “I Surrender All” by Judson W. Van DeVenter and Winfield S. Weeden, a song in public domain. The remainder of the song is my own work and is under copyright. “Holy God” also took many years to write and has gone through many versions. God first revealed Himself to me personally through nature, the glorious and intricate things He created. The Bible says in this life we see dimly as through a dull glass. Still, every now and then, we experience moments when we can peek through the curtain on heaven’s window and see a little more clearly. Then we know without a doubt that God exists and is holy and beautiful beyond our comprehension. “Song of the Redeemed” was inspired by my pastor’s series on the book of Revelation. How incredible to think of that day when we will finally see our Savior face to face in all of His glory and sing the song of the redeemed with people from every tongue, tribe, and nation! The lyrics are based on Revelation 5:9–10 and 19:1–8. 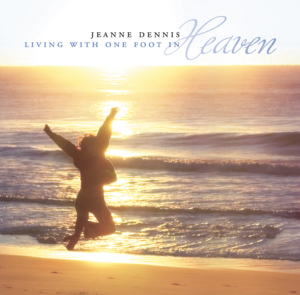 I included “Panis Angelicus” on this album in memory of my sister Christine, who died just after her 51st birthday. We used to sing together at family events and we always had a friendly bicker over who would get to sing “Panis.” Singing it at her funeral was a great honor and one of the most difficult things I have ever done. I used a majestic pipe organ for the accompaniment here to keep this classical song in its traditional context. The original latin lyrics came from Thomas Aquinas in the 1200s and were set to music by Franck in the 1800s. Brendan Joyce has mentored me through the production of this album, training my ear as well as my LogicPro skills. I am deeply grateful for his patient guidance and encouragement. Special thanks to Dr. David Beauchamp for his inspiration and for checking my lyrics for faithfulness to Scripture. I would like to thank Robert Wynne and DJ Schott for their encouragement, musical suggestions, and training in LogicPro. I am grateful to Jimmy and Carol Owens and Scott Wesley Brown for teaching me how to make words sing. More than anyone, my husband encourages and supports me as I write and share the music the Lord gives me. I am so grateful to Steve, my biggest fan. 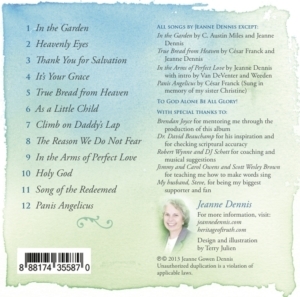 This album is dedicated to the memory of my sister Christine McLellan, who used to sing Panis Angelicus beautifully. It was always a favorite of hers, and when I sang it at her funeral, I realized there was a need for a good performance track of this song. I also wrote a contemporary arrangement to update the song for those churches that prefer a more modern style. My new English lyrics, “True Bread from Heaven,” are appropriate for use in both Protestant and Catholic churches. 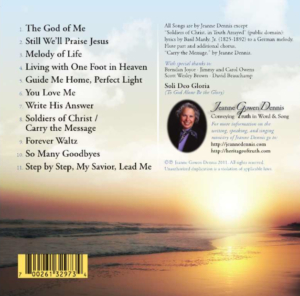 This collection of songs expresses the journey I have walked in my relationship with Jesus Christ in the past several years. For example, the Lord gave me the joyful chorus to “Forever Waltz” in the midst of an extremely difficult time. I wrote “Still We’ll Praise Jesus” while pondering the plight of persecuted Christians around the world and considering what my reaction would be—and must be—if I ever face the same. “The God of Me” and “Melody of Life” celebrate the wonders of creation that bear witness to the beauty, power, and might of our Creator, evidence I observe each and every day. “Living with One Foot in Heaven” speaks of the spiritual battles we face and recalls the full armor of God we must put on daily to defeat our enemy, the devil. This is the music we used to introduce the early Heritage of Truth online television shows (still available on our TV and Blog). I was teaching a Bible study on the book of Ruth while writing “You Love Me,” a song that expresses my incredulous gratitude for God’s gift of love in spite of my sinfulness. The story of Ruth and her marriage to Boaz is a beautiful picture of our redemption by Jesus, and this book inspired me as I wrote the lyrics for this song. I wrote “So Many Goodbyes” when my husband was traveling almost full time on a day when found it especially hard to say yet another goodbye. People also find this song comforting when they have lost a loved one. “Guide Me Home, Perfect Light” is a revision of a song I wrote many years ago that had never quite satisfied me. I wanted to take listeners from confusion, hopelessness, and loneliness to the certainty of God’s presence and His promise never to leave or forsake us, even when we can’t tell He’s with us. I wrote “Write His Answer” in preparation to do a keynote speech at a writer’s conference with that theme. While considering the title, I realized that it is in believers’ everyday lives that we write God’s answer for the world’s pain and confusion. “Soldiers of Christ/Carry the Message” combines a chorus I wrote with an old hymn by Basil Manly Jr. At that time, the Lord was helping me understand the importance of sharing the best gift of all, the gospel of Christ, with others. Nothing matters to me more than my relationship with God through His Son, Jesus, so you might view this album as a collection of love songs to Him. I hope you enjoy it, but more than that, I hope this album draws you closer to Him to whom all glory and honor and praise belongs. With special thanks to my mentors: Brendan Joyce, Jimmy and Carol Owens, Scott Wesley Brown, and David Beauchamp.